Great news, everyone: the afterlife exists! Not necessarily for your consciousness or soul or whatever you call the nonphysical part of your body -- jury's still out on that -- but for the trillions of bacteria that inhabit your mortal coil. They'll still be partying long after you kick the bucket. "Microbiome." Specifically, the trillions of bacteria living inside you. If you don't know what "microbiome" means, think back to elementary school, when you learned about biomes like the rainforest, tundra, and grassland. These communities of plants and animals give rise to incredible biodiversity -- and the human microbiome does the same thing on a smaller (you might even say "micro") level. "'Microbiome' is a term used to describe the dynamic ecological system within and on our bodies, made up of bacteria," says Saba Afshar, a University of Queensland medical student studying nutrition and diet. Hundreds of thousands of types of bacteria flourish all over the world, in environments ranging from deep-sea hydrothermal vents to gas station bathrooms. But only about 1,000 types of bacteria are found exclusively in humans, according to a report by the American Society for Microbiology (ASM). Those bacteria really like living in people (to the extent that a microorganism can like anything). The proof: you have about 37 million human cells and 100 trillion bacterial cells. Bacterial cells outnumber human cells in your body by a three-to-one margin, according to the ASM's report. So does this mean that every human being is a conglomerate of weird, creepy bugs, much like Oogie Boogie Man of The Nightmare Before Christmas fame? I'm more bug than human?! How can this be? Scientists and researchers are uncovering the ways bacteria communicate with each other and with our bodies, Afshar says. "Science has known for a long time that an individual is carrying three times the number of bacterial cells as our own human cells, but we've only recently begun to fully explore the implications of this fact," Afshar says. Here are a few things we've learned: "The National Institutes of Health's Human Microbiome Project… discovered that gut bacteria regulate our circadian rhythm (our internal clock) by producing a fatty acid in a pattern that influences our circadian clock," Afshar says. "Even more profound -- if we consume a high-fat diet, we are disrupting this bacterial pattern and therefore disrupting our own circadian rhythm, which negatively influences our metabolism." Want to know something really crazy? The ASM reported that when skinny mice receive the microbiomes of fat mice, the skinny mice get fat. Also, some autoimmune disorders, like celiac disease and allergies, have been related to differences in microbiomes, the ASM's report states. "New research is exploring gut bacteria's role in digestion, inflammatory bowel disease, cardiovascular health, obesity, asthma, diabetes, and even mental health," Afshar says. What does any of this have to do with fermented foods? The answer should be obvious now: you are what you eat when it comes to bacteria. Probiotics ("good" bacteria) play a huge role in your overall health -- a healthy balance of bacteria is essential for maintaining a healthy stomach and solid, reliable bowel movements. 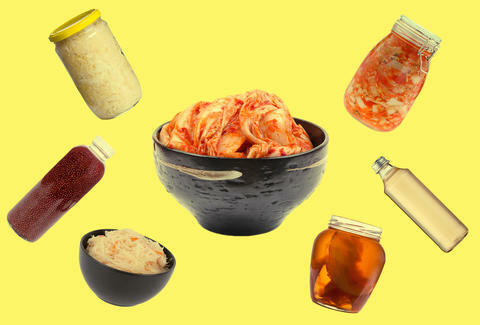 Fermented foods have probiotics in spades. Also, they're delicious. "Lactobacillus is used in a wide variety of products, including yogurt, sauerkraut, cheese, pickles, cocoa, tempeh, and even beer," says Julie Nieto, a registered dietitian at Ochsner Fitness Center. When you eat these foods, it helps populate your microbiome with friendly bacteria, which helps maintain all the above potential negative effects of a crappy microbiome. In other words, pass the tempeh dog, pickles, sauerkraut, and beer, bitte. They're good for you! People have done it for thousands of years. "One of the reasons why humans began to ferment to begin with is preservation," Nieto says. "By fermenting a food, you are significantly extending its shelf life. If you don't think you're going to get through all those veggies before they go bad, ferment them, and you've got a healthy, tangy snack for weeks or even months to come." But what if, like me, you had East of Eden on your high school's required reading list and ended up scarred by John Steinbeck's description of botulism? (Sample sentence: "Are you still bleeding from the bowels?") Isn't canning your own foods an invitation to paralysis and death? Not to worry. The culprit here is canning, which relies on heat to kill all bacteria. Botulism happens when that process goes horribly wrong. "With fermenting, you need bacteria to survive to preserve and protect your food," Nieto says -- the process of killing bacteria, while good for preventing outbreaks of E. coli from mass-produced canned foods, also kills the bacteria you actually want, both for preservation and your gut. "You do not need to store foods in an airtight environment once it is fermented. Think how long that half-eaten jar of pickles has been sitting in your fridge." Sure, you could buy a $6 bottle of kombucha... or you could throw a gallon of sweet tea in a jar along with a symbiotic colony of bacteria and yeast and forget about it for a few weeks (yum). You could load up on kimchee, yogurt, and those pickled green beans that go in Bloody Marys. If you want to take the plunge yourself, there are all sorts of home options that are relatively straightforward; the main ingredient is patience, which you'll need while the bacteria work their magic. No matter which tasty fermented food you choose, you'll welcome billions of probiotics to the microscopic rave that is your body. Missy Wilkinson was not being sarcastic when she said "yum." Follow her on Instagram @nowlistenmissy.